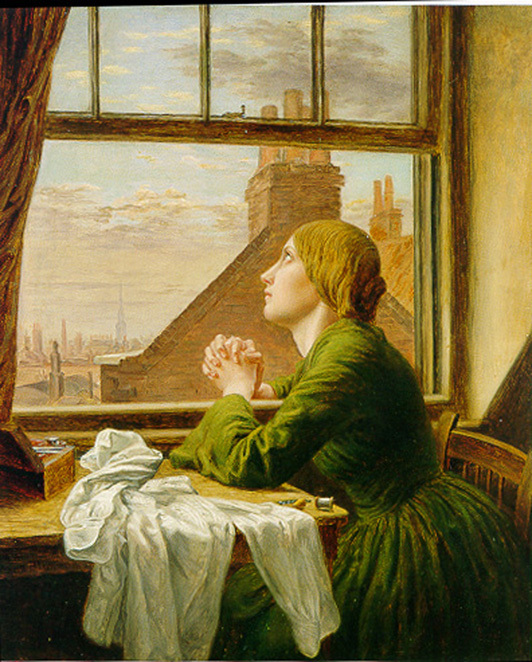 “By far the most popular of all the examples of social themes in Victorian painting was the seamstress. Fostered by articles in newspapers and in periodicals, encouraged by attention in parliamentary reports, it received its greatest impetus from a literary source. In December 1843, Thomas Hood’s The Song of the Shirt was published …in…Punch. Overnight both the poem and the magazine became a sensation. Its publication is said to have trebled the circulation of the magazine…Quoted by nearly every paper (beginning with The Times), printed as catchpennies, set to music, dramatized by Mark Lemon (the editor of Punch), even printed on handkerchiefs, The Song of the Shirt soon echoed from the ranks of every social class. Hood’s lines became an enduring symbol for the Victorian populace generally and for reformers, painters, and illustrators specifically…. T.J. Edelstein, “They Sang The Song of the Shirt: The Visual Iconology of the Seamstress,” Victorian Studies, vol. 23, no. 2 (Winter 1980): 184-5, 186, 190.